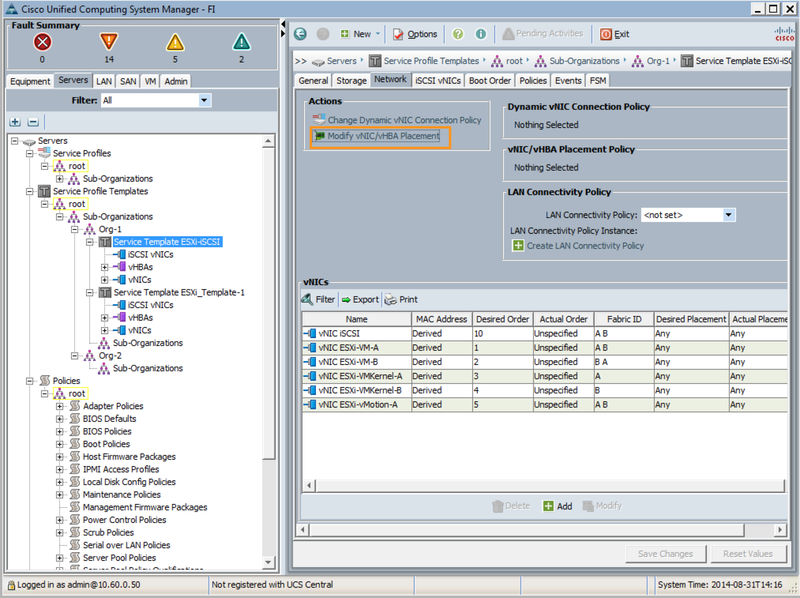 Drag all vNIC on the left to vCon 1 on the right. 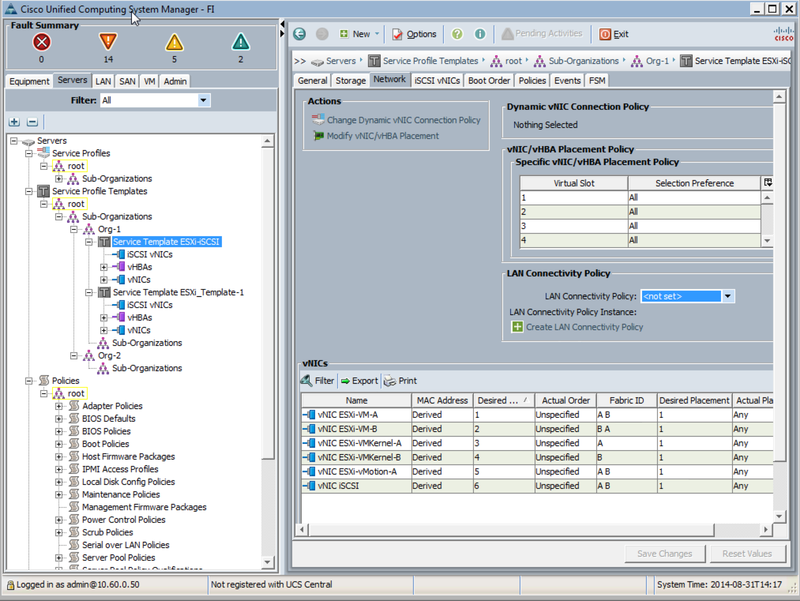 Ensure iSCSI is at the bottom. Notice the ordering is now sequential starting at “1”. 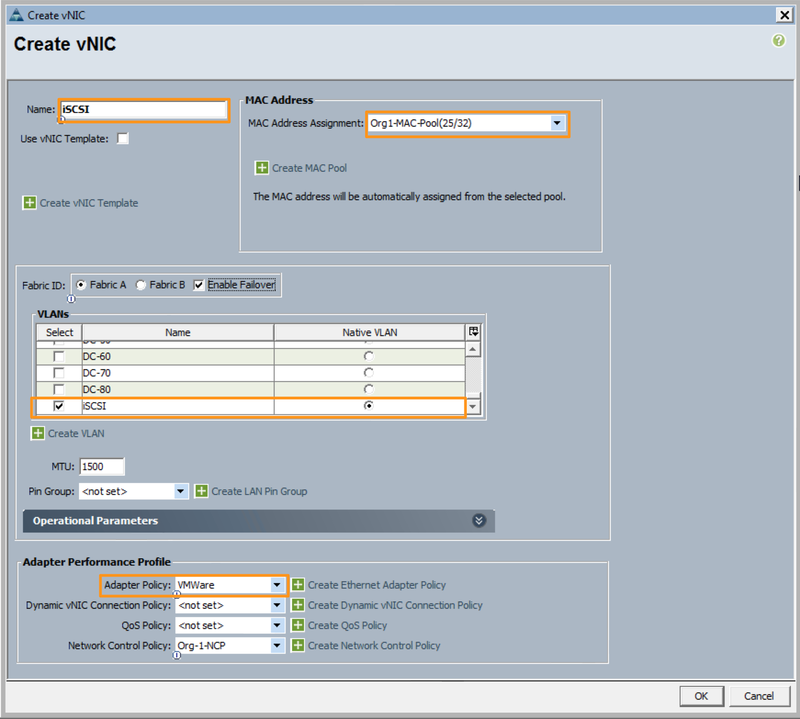 This is easily confused with the vNIC created earlier, but this is completely separate and actually isn’t really a vNIC, it’s an iSCSI bootable firmware table (iBFT) used of iSCSI boot. 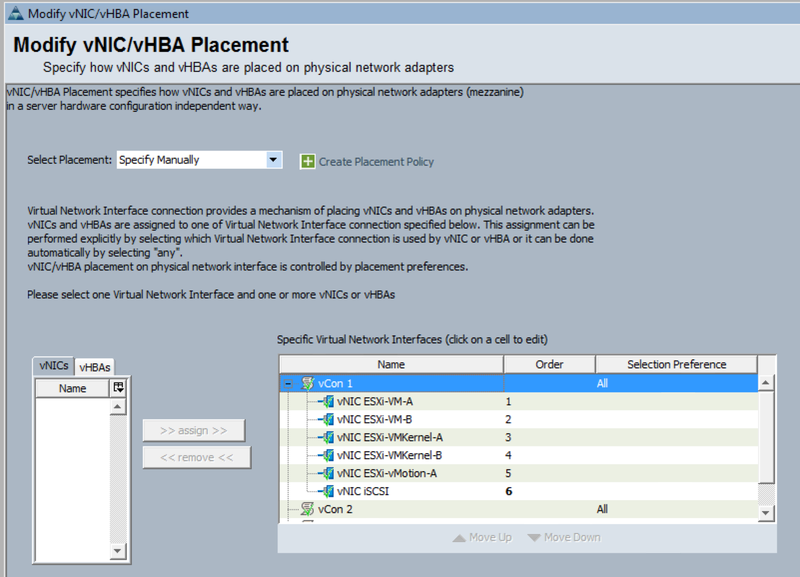 Think of this as a virtual placeholder for the iSCSI traffic. 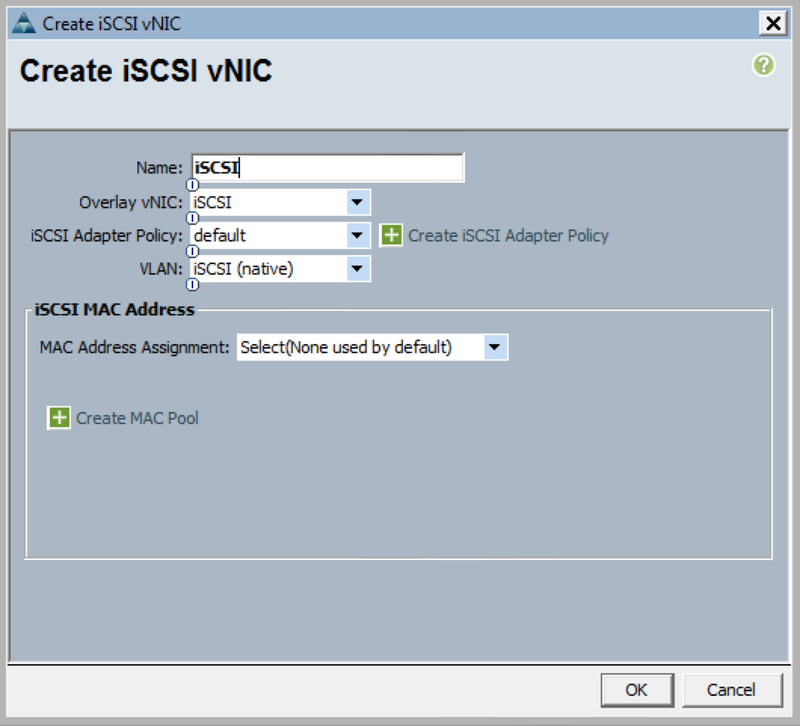 Give it a name, set the Overlay vNIC as the one we created earlier, set the native VLAN to the iSCSI VLAN. 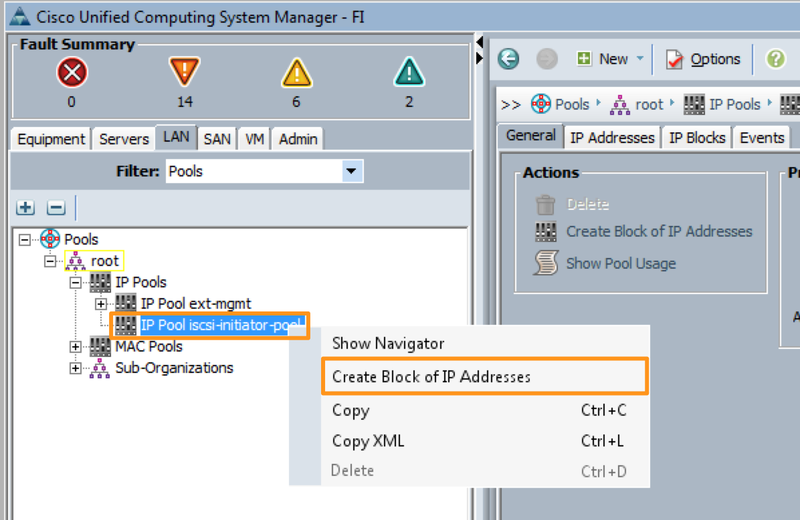 Do NOT assign MAC addresses here!! Will not boot if you do!! 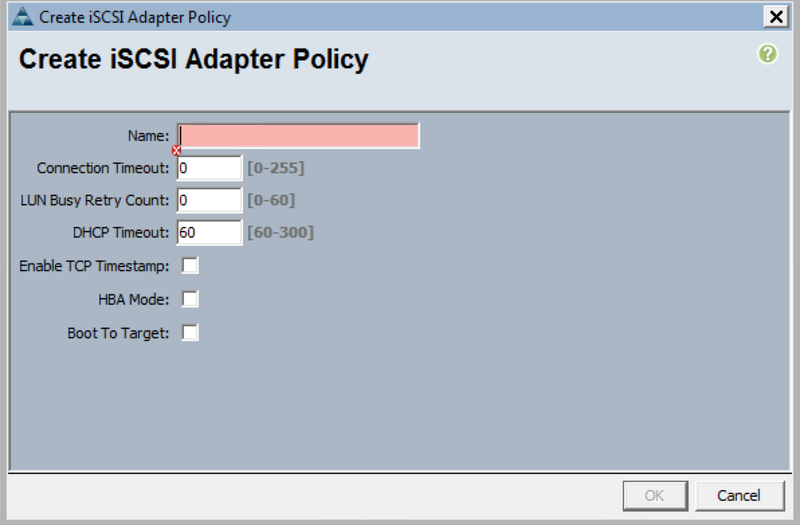 If you wanted to create an iSCSI Adapter Policy for some additional parameters, here is where you do so. I’m not configuring any. 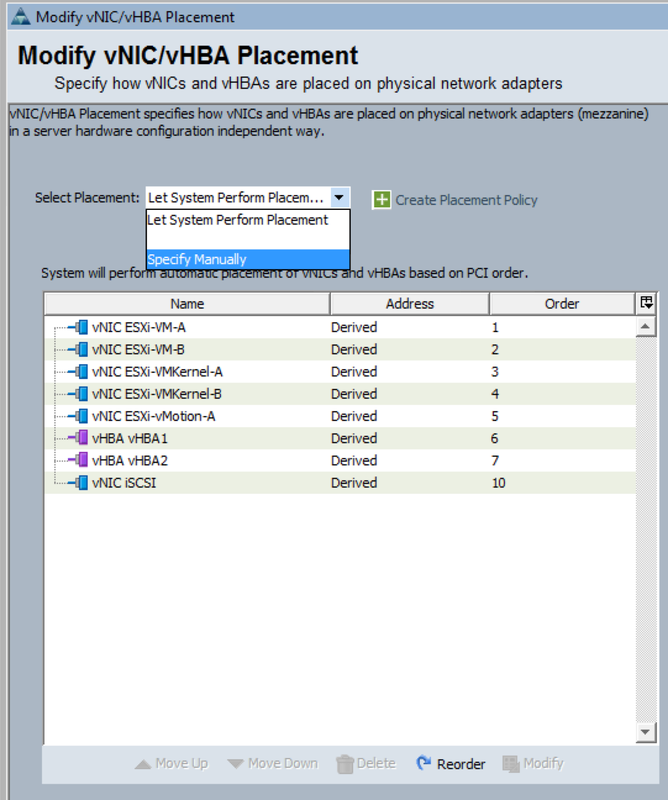 Click “Set Boot Parameters” under iSCSI vNICs. 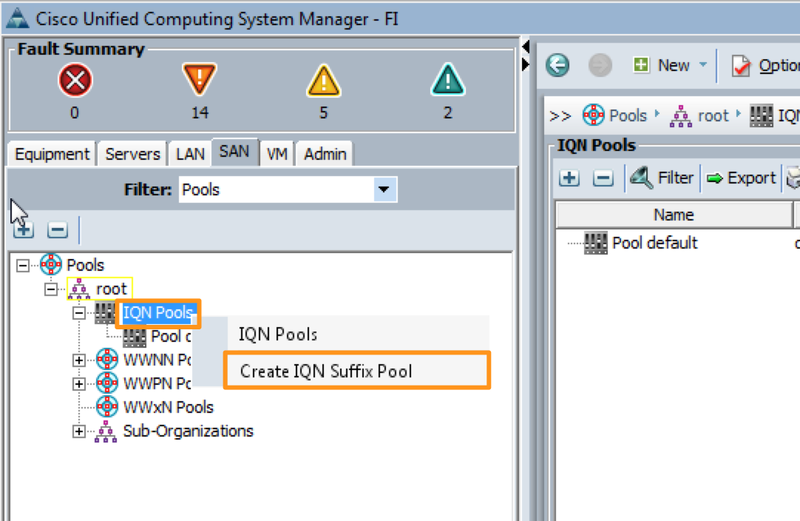 Choose the Initiator pool, and IQN pools created in the beginning (Note, we could have also created the pools from here, I just like to do them first). 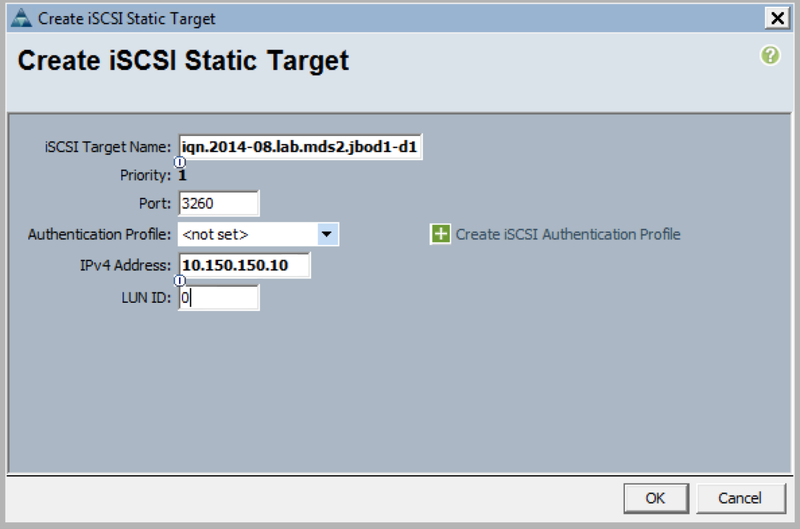 Then click the green “+” to add an iSCSI target. 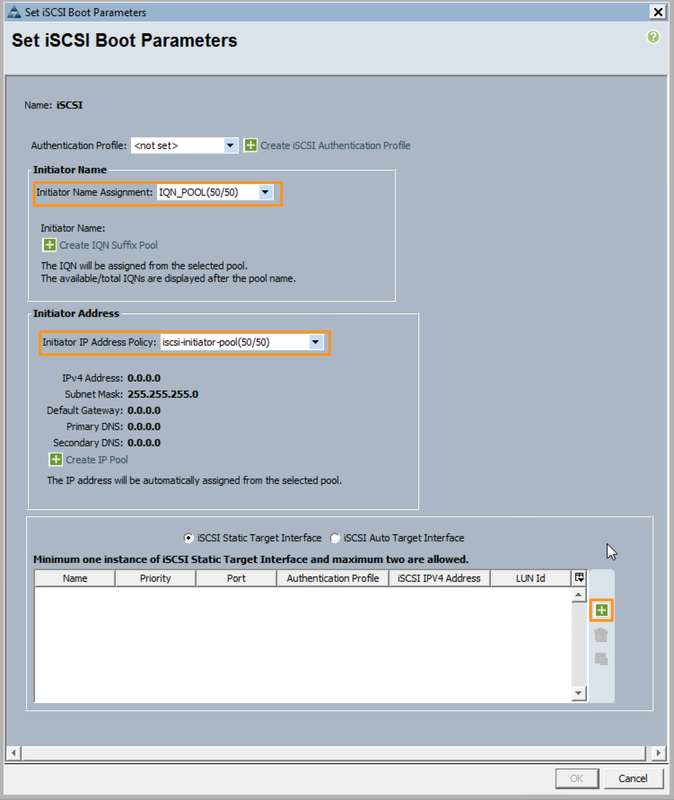 Enter the iSCSI target name, IP and port. 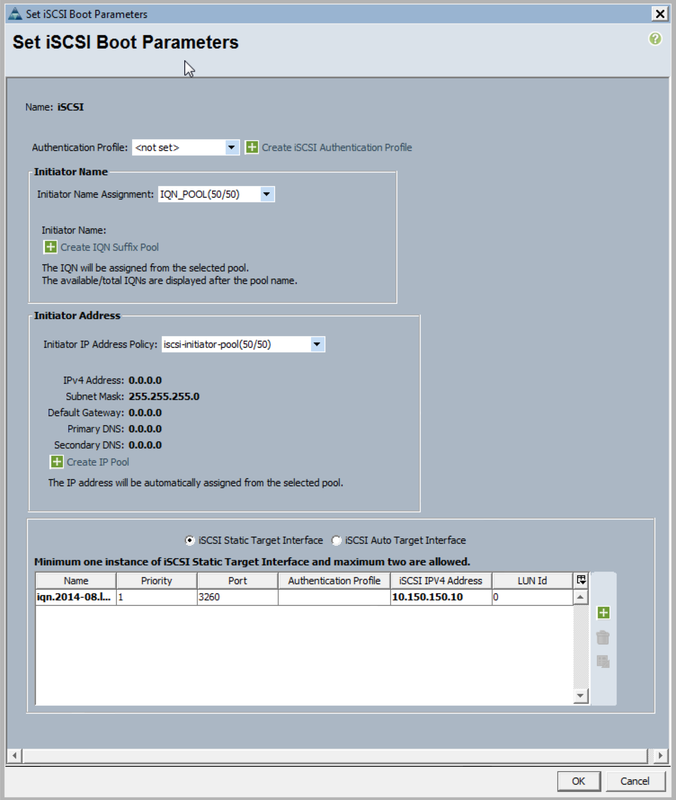 Set the LUN ID if necessary. Click OK, Notice we now have a target. 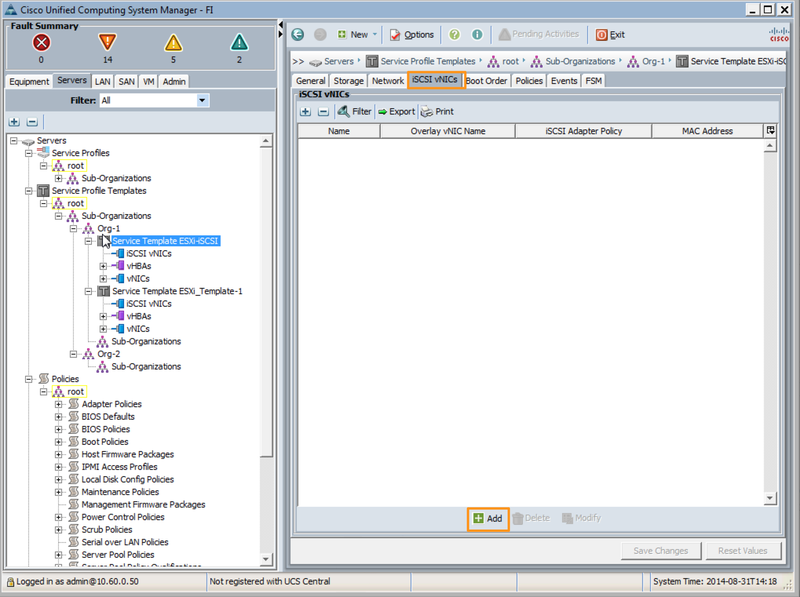 Go to your storage network and configure necessary communications. 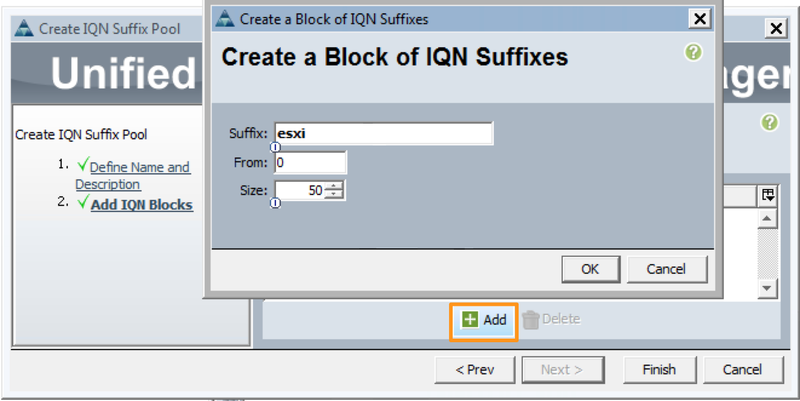 I’m using iSLB in this example, but you can use anything. 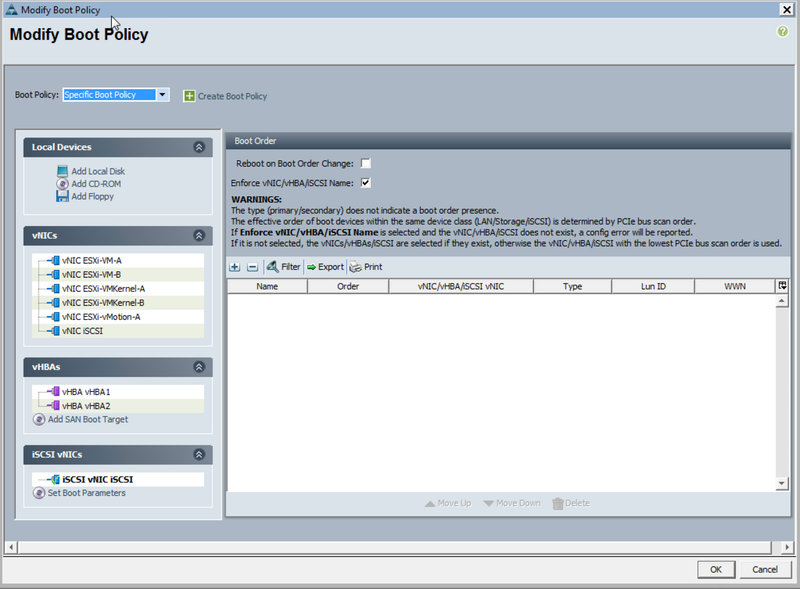 Boot the server (service profile). 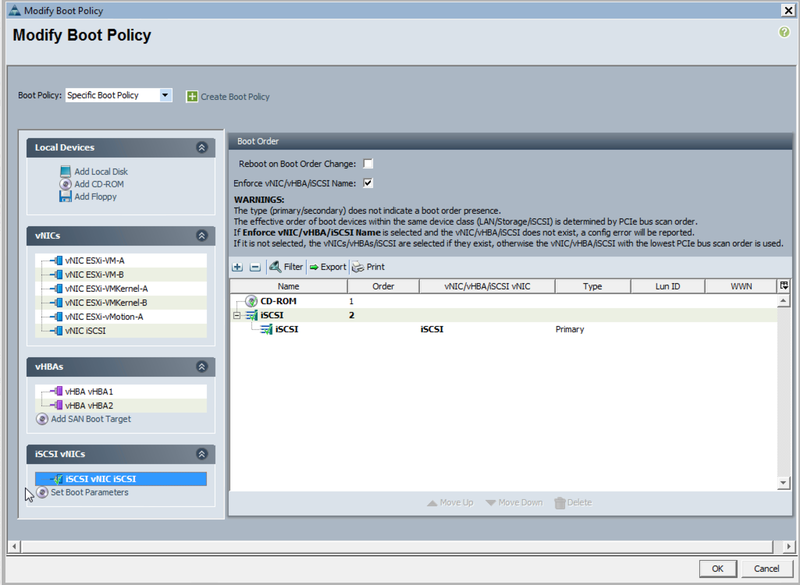 hi, I’m installing the same setup to one of our customer, os is vsphere 5.5. 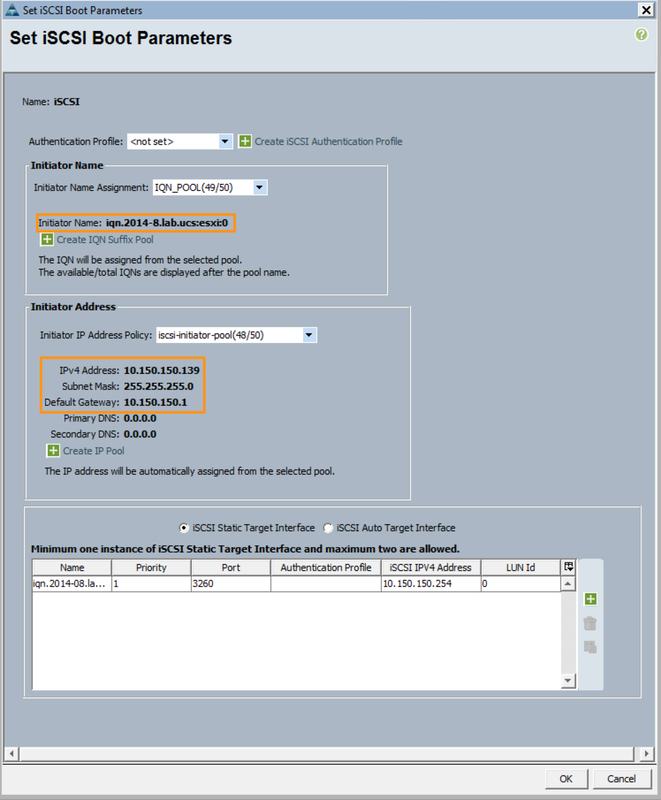 2 if I configure esxi with the right ip address and other configuration, then reboot the server, it is restored as just installed with the configured ip address, for the iscsi vnic. do you have idea of what is causing this strange behaviour? i’m having the same problem. did you find the solution alessandro?